Polaroid cameras became the latest in high-tech photo taking technology a few generations ago by printing out pictures on the spot. But ever since digital cameras made all photos instantaneous, the brand has been looking for ways to reinvent itself for a younger crowd. And thus, the Polaroid “Shot Glass” camera mount – a shot glass that literally lets you strap Polaroid’s tiny Cube digital camera into the base – was born. At a mere 1.38 inches cubed, the aptly-named Polaroid Cube can be seen as Polaroid’s answer to the GoPro. And now, the camera company wants its Cube to go with you on your next big drinking excursion. 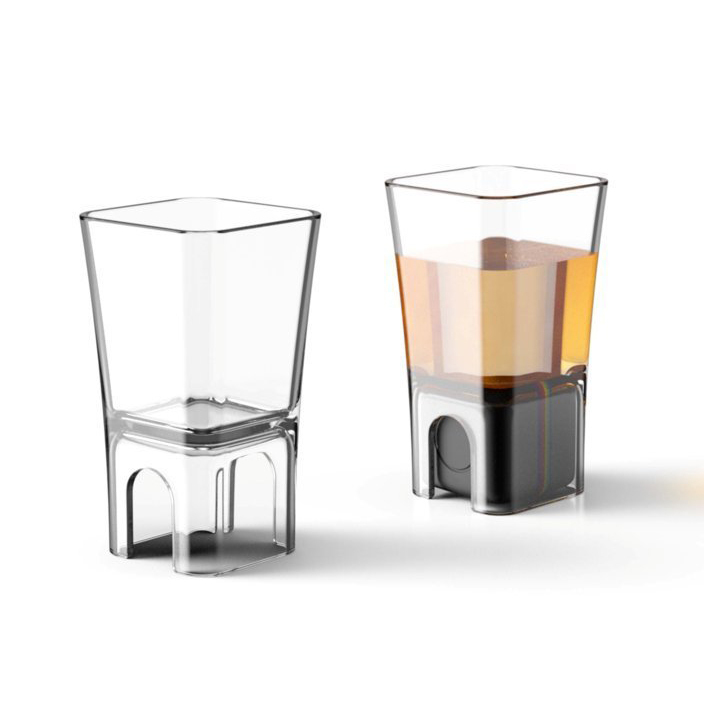 The new Shot Glass mount, which is made by Polaroid itself, is an otherwise standard-looking clear plastic shot glass with an open square base specifically designed to securely hold its tiny digital camera. At just $15, the Shot Glass camera mount sounds like a must-have for any Cube owner/alcohol drinker and certainly seems like a fun way to document guests at a party or even a wedding – though from a practical standpoint, it probably takes some getting used to, otherwise you may end up with a lot of videos and photos of nothing more than a ceiling immediately followed by a close ups of the interior of someone’s mouth. Regardless, officially releasing a shot glass mount is great publicity for the company. I didn’t even know Polaroid made their Cube line of cameras until right now. I’m guessing there are plenty of people out there who might be shocked to know that Polaroid is still around at all. Thankfully, even though Polaroid has struggled to stay relevant, drinking never goes out of style.